Item # 10402 Price: SOLD Tell me more! A very attractive and rare golden snake to wrap around your wrist. Extremely Fine condition with no damage or repairs. Hallmarked, Forstner 1/20 12k GF which indicates that this bracelet is gold-filled. Jewelry marked 1/20 G.F. 12 Kt. is at least 1/20th gold and is layered with 12 karat gold. To be classified as gold-filled, a piece must be at least 1/20 gold by weight. Item #10971 Price: SOLD Tell me more! Intricately detailed filigree surrounds a sparkling pink glass jewel. Even the top edges of this bracelet have been embellished. Created from gold washed brass. Not hallmarked. Extremely Fine condition. Item # 10639 Price: SOLD Tell me more! Dozens of sparkling rosecut garnets adorn this brass bangle bracelet. The garnets are set in three rows with the middle row being slightly raised and edged in brass. Extremely Fine condition. Not hallmarked. Item # 10494 Price: SOLD Tell me more! Art Deco with an Egyptian accent! This dainty little pendant is created from silver which surrounds a faceted piece of pink glass that is not shocking but electric. The glass has been flashed to give it a most unusual glow. The intricately detailed bail from which the pendant hangs seems somewhat Egyptian in style. The stone is surrounded by delicate floral filigree. Hallmarked. Item # 10484 Price: SOLD Tell me more! A real dazzler. This wide gold toned mesh bracelet with its dozens of rhinestones sparkles so brightly it is positively blinding. Each rhinestone is prong set and every rhinestone is full of sparkle. No dark or yellowing rhinestones. Extremely Fine condition with no damage to metal or rhinestones.Safety chain attached. Closes with a push clasp. Hallmarked, Hattie Carnegie. Item # 10654 Price: SOLD Tell me more! Lovely rose pink beads! A delightful bracelet from the 1930's created from hand-made transparent rose pink glass beads. The ends of the larger beads at the front of the bracelet are capped with gold gilded brass flowers. Item #10249 Price: SOLD Tell me more! Very Deco! Created from rhodium plated sterling silver, faceted black onyx and sparkling marcasites. Perfect condition!! Screwback. Item #10442 Price: SOLD Tell me more! 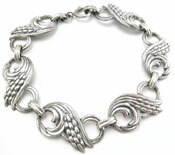 Uniquely styled heads of wheat curl around this beautifully crafted sterling silver bracelet by Danecraft. Extremely Fine condition with no damage to the silver.Hallmarked, Danecraft Sterling. Item # 10707 Price: SOLD Tell me more! A 1930s necklace comprised of brass filigree and large sparkling topaz glass stones. The stones are bezel set in brass and each is additionally ornamented with a brass flower that extends from the edge of the bezel to the center of the glass. Extremely Fine overall condition with no damage to glass or metal. The necklace bears no hallmark. Item # 10780 Price: SOLD Tell me more!